She figured that if she wasn’t going to be any one place, she might as well be all over. Embarking on a tour of Europe, Davachi found herself visiting churches and cathedrals, seeking in them a sense of peace and calm. Not only did she find what she was looking for, but with Gave In Rest, she’s able to offer it to others. She’s not eager to categorize the records gentle drones and slowly unfolding melodies as “new age” music, but still, songs like the hovering “Third Hour” and “Gilded” (featuring Echoplex treated piano) nonetheless possess distinctly healing qualities. It’s a beautiful record, which makes it a timely one, and we rang Davachi up to discuss its unlikely genesis. AD: You weren’t situated anywhere while making Gave In Rest. Did that sense of uprootedness inform the tone of the music? Did you find yourself using the music as a retreat from the hectic life you were living? Sarah Davachi: Yeah. I think that’s what it’s about. When I was traveling, I kept trying to find these rituals to slow things down. When I travel, I always like to check out local cathedrals, because I think they’re beautiful buildings and the acoustics are nice. But this trip, I noticed more the feeling of sitting there, being in this very different space from the outside world, being able to sit and not do anything. That became important and influenced the way I was thinking about the music. It made me want to tap into that feeling. When I got to Los Angeles, I’d replace sitting in a church with sitting in a chair and looking out the window for an hour. Those moments, of ritualistic quietude — the music became an extension of that. AD: Have you always been interested in visiting churches and places of worship? Sarah Davachi: Yeah. It’s kind of a weird feeling for me. I was raised super secular. Nobody in my family is even remotely religious. I don’t support religion as a thing, but at the same time, I’m attracted to these spaces. In my adult life, it’s been a weird thing to reconcile, wanting to be in these buildings with being opposed to what they stand for. When I was at Mills, doing my master’s degree, I did my thesis for pipe organ and electronics. I performed it in this chapel there. I think that was the start of it, on a more serious level, wanting to engage with the acoustics of these spaces and having the visual element tie into it. The way you listen to the music there is so different from being in a bar or whatever. But it was last summer that I felt I needed those spaces in a different way. I remember specifically, there was one church that knocked me sideways. I was in Prague, walking around the old part of town and I found a church. It turned out to be a Byzantine Orthodox church; there was a service going on and I couldn’t understand anything anybody was saying. Sitting there, it didn’t feel religious to me at all. The sounds, the chanting, the smells, everything, removed me from anything I was thinking about or worrying about. When I came to LA, there’s so much space here. I can go a day without seeing another human being. You can be so removed from normal life, and that’s been so important to me. When you’re in big East Coast cities, it’s a different experience. Here you can disappear whenever. So that was an interesting parallel. AD: That solitude you’re talking about is an incredibly helpful thing in terms of clearing the mind, and I think it even enhances your community experiences with others, too, when you do go out and engage with them. Sarah Davachi: I hate throwing around the word “psychedelic” because it gets used so much, but it was. I remember another time, in Antwerp, sitting outside a cathedral in a public square. It was super busy, it was a Saturday afternoon. I remember sitting down to listen to the church bells and completely zoning out of the public sphere, just listening to the psychedelic resonance of the bells in this outdoor space. It was a way of cutting off the outside world to focus on this thing that felt very pure. It was a way of appreciating an aesthetic quality. I guess that’s a bit ironic, to go to a church to appreciate an aesthetic, mystical experience you can’t describe, but not necessarily a spiritual one. It’s a weird separation for me. But at that time, it was necessary for me to stay sane while traveling. AD: I hear in your record a hymnal quality. If someone were to describe your songs as secular hymns, how would it make you feel? Sarah Davachi: I kind of think of it that way. I think it of it as being on the side of mysticism rather than spiritualism. People have asked me in relation to previous records about meditation, and I’m not an especially new age-y person. I don’t meditate. I’m not on that way of thinking about music, but for me, there is a secular element of mysticism. That’s appealing to me. I have a lot of classical training behind me. And that’s another thing I’ve struggled to reconcile. I played classical piano for decades. I liked doing it, and I still like doing it, but when I was 20, I hit a wall. I wanted to make music, but I knew that wasn’t the vehicle for me. Since then, I’ve always been trying to reconcile an interest in the harmonies and way things work in that kind of music, but take it to the place where I function as a composer. I think that became clearer on this record. AD: Do you ever imagine the practical uses people might bring to your music? Sarah Davachi: Right from the beginning, I started caring about making music because I [had gone] through a phase [of] hating music. I hated going to shows. I just felt there was something missing in the experience. What I wanted to force people into with my music was this way of actually listening. I found that people are so impatient, they gloss over the things you should be listening for in sound. From a scientific standpoint, sound is such a fascinating thing we don’t explore in detail. That’s why I got into psychoacoustic music — it was this really interesting way of examining sound. Maybe worshipping is a stupid word, but at least paying homage to sound itself as opposed to any extramusical thing beyond it. That was the initial thing, I wanted people to pay attention and learn the ways they’re being impatient listening to music. AD: But that’s changed for you some? 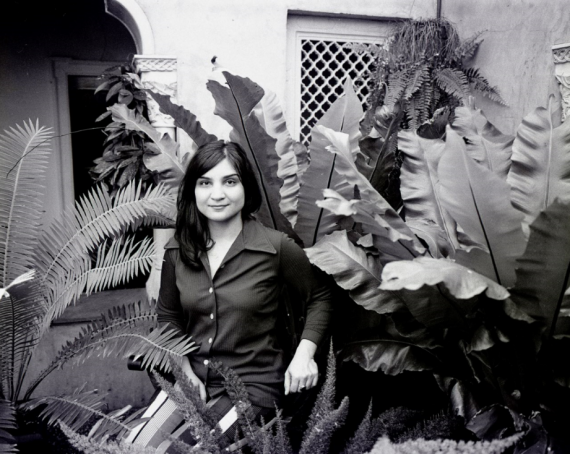 Sarah Davachi: I think now I’ve learned people are going to take from it what they want. That’s good. You don’t want to restrict people. I have a lot of people say my music helps them fall asleep. That’s not an intentional thing, but I guess now more than ever, I think of music as an explicitly aesthetic thing. I like to create things I think of as beautiful sounds. AD: If someone were interested in approaching your music with deep listening as the goal, how would you instruct them to do so?